A while ago God gave me an image of church needing to be like weaving a basket. The vertical ‘spokes’ which create the initial framework of the basket are like church structures. They are essential but not enough. They give the outline shape of the basket but of themselves do not create a basket that can be used. They also have gaps between them, so just like this it is not a strong vessel. This includes the hierarchy/leadership of a church. It is vital as the backbone of the church but without the weaving is insufficient. It is the weaving in and out, under and over the spokes which then creates the vessel which creates the basket shape, the true structure of the basket. Only when the weaving is in place can a basket be used for carrying things. There is a big emphasis these days on church leadership and training up leaders and this is important. However the ‘ordinary’ folk have as essential role to play in developing a church community as the leaders. It is the weaving on a basket which holds the spokes in place. The spokes on dependent on the weaving not the other way around. 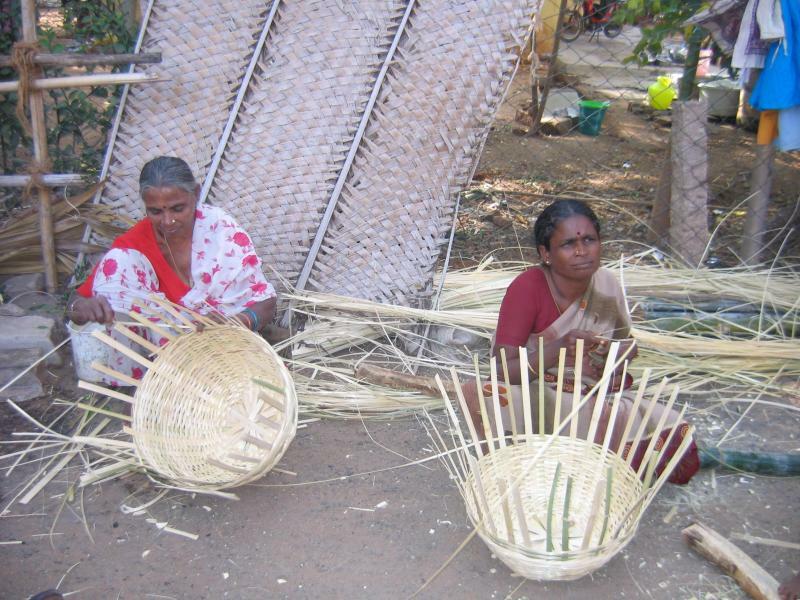 The basket maker weaves the horizontal strands very close together so that they touch. This gives it strength and durability. From a distance you don’t see the individual strands, you only see the finished object. Those of us ‘ordinary’ folk in church have a role to play in being woven in and out of one another’s lives. We are not to rely on the leadership for it all to happen but look for our places. Often we look for our role to play in church life, yet we may have multiple roles to play, living as in a Venn Diagram in overlapping circles being involved in several activities and touching different lives in each. At home I have a log basket. It is starting to fray at the top where some strands have come loose and broken off. Because it is looking a bit tatty, I keep saying that when it falls apart I will get a new one but the overall structure is so strong that it is still going and I am nowhere nearer to getting a new one. BUT the bits on the top edges have snapped off. Because they were at the edge they were most vulnerable to coming loose. Folk who are at the centre of a community have plenty of strong bonds to keep them there, but those who are at the edges (for whatever reason and there are many) are in danger of drifting loose and being snapped off. Therefore, we need to take special care of them. Pastor Evans … gave me this time. I remember long hours sitting and talking in his study surrounded by books. Over those early years there were a number of people who took me seriously, and through those conversations I came out wanting to love God more and serve Him better. Building up community takes time. It will include lots of interactions and conversations for which you cannot ‘justify’ the inordinate amount of time taken, and in our world of striving to manage every minute of our day, much time will seem to be wasted. Yet looking at Jesus’ life you hardly hold him up as someone who managed his time well. A 1st C time management consultant would have mapped out a far more efficient route which would have covered a lot more ground, taking in far more ‘large’ and ‘important’ places and people in the three years that Jesus spent on his ministry. But Jesus listened to his Father because he ‘wasted’ hours in prayer, so he knew where to go today and who needed he needed to meet with. So how do we weave ourselves in and out of each others lives? We are to do these things because we belong to one another (Romans 12:5; Ephesians 4:25). If like me you struggle with forgiveness read this article. It is awesome. As a result of reading I am finally able to let go of the past. I hope it helps you too. There are times when we come to the end of ourselves, ground down, utterly weary and beaten. Life has sapped our strength, as disappointments have overtaken hopes. We have tried everything and still not been able to mend whatever it is that has been broken. It gnaws away at our very souls. It was the same for the woman who had been bleeding for twelve long years. During that time, she had spent all her resources on doctors seeking out a cure. Now she was penniless and almost out of hope. And a woman was there [in the crowd pressed around Jesus] who had been subject to bleeding for twelve years. She had suffered a great deal under the care of many doctors and had spent all she had, yet instead of getting better she grew worse. What happens in moments such as these? As we come to the end of all we have and are, where do we go now? What do we do? The woman chose to reach out to Jesus knowing that he alone could save her. No one else would do. 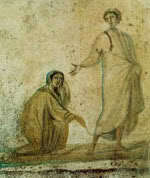 Jesus senses that touch and looks back, ignoring the disciples whittling on about the crowds. He won’t move on until he has spoken to the person reaching out to him. Twice she has to go to him. The first time she barely touches the tassels on the corner of his cloak. This time she speaks directly with Jesus himself. Both times it took courage. Both times he responds to her. Touching his cloak she is healed physically. After speaking face to face with Jesus she receives something even more precious. In Hebrew “Go in peace” is ‘Shalom’ which means wholeness. Jesus not only heals her body but speaks words of life into her very soul as well. That word is not only for a woman 2,000 years ago. It is for all of us. Jesus came that we all might have life and have it to the full (John 10:10). But, like the woman, in order to receive it we have to reach out. Jesus is waiting and willing but we need to ask first. Reach out and grab the hem of his garment. Jesus is never too busy with the rest of the crowd. He will stop and look back for you. He will listen as you tell him your story. He will speak healing into your life. “Take heart, your faith has healed you. If this has spoken to you in any way or you too know what it is like to wait for healing then write and let me know. Hope often comes from knowing that you are not the only one like this and others have gone this way and found what they were seeking.